“My dog is limping but he’s not in pain.” We hear that a lot around here, usually from new Tripawds members whose dog is suspected of having a limb cancer. Sadly, the unfortunate truth is that whenever an animal is limping, they hurt. And when that happens, it’s up to us to do something about it. This week we are focusing on how dogs show pain as part of Animal Pain Awareness Month. 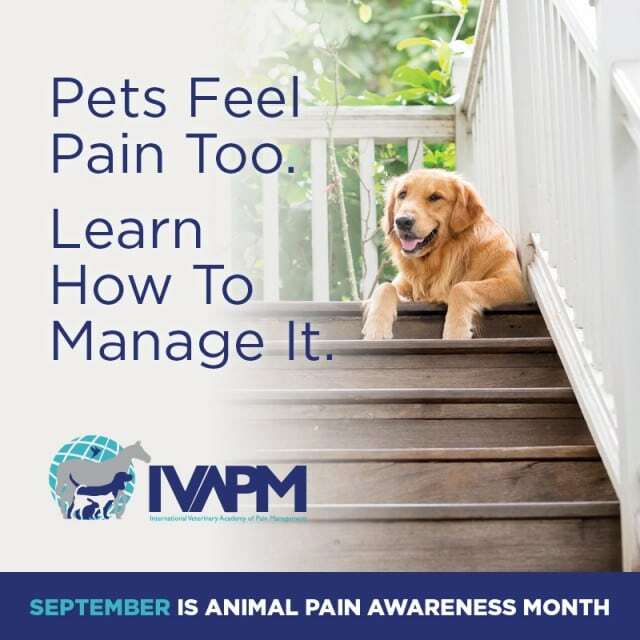 Learn how to help your dog during #PetPainAwareness Month! All animals have non-verbal ways to tell us they hurt. It’s our duty to recognize and interpret their pain indicators, then do something to help. Acute, which results from injuries and post-surgery pain. Dogs may give you one or several of pain indicators listed above, but as time goes on and the pain gets worse, limping is one of the most common signals that something is wrong. “Limping is always a sign of pain, whether the limp is subtle or noticeable,” explains Dr. New. The hard part is that for a Tripawd who seems in otherwise good health, pinpointing a limp is tough. Tripawds already have an odd walk, so close attention to their gait is critical. Take Tripawds Spokesdog Wyatt Ray, for example. Lately he’s developed a subtle shift in his gait, which started after a short lake swimming session. While getting out of the water, we think he twisted something on the rocky shoreline. Can you see his odd gait? We had a hard time seeing it, but when we showed this video to the sports medicine team at Colorado State University, his therapist Dr. Sasha Foster could tell something is up, possibly with his tarsus (hock) or his cranial cruciate ligament. We explained that he was hesitating to climb onto our couch (just 22″ off the ground), and when going up steps. Wyatt is seeing Sasha tomorrow, and will keep you posted on what she says. Meanwhle Dr. New explains that if you suspect your Tripawd is in pain, it’s important to let your vet know as soon as possible. “Schedule a same-day appointment with your family veterinarian. If your family’s veterinarian is not open, bring your pet to your local veterinary emergency clinic,” she urges. And most importantly, never give your pet any pain medications at home without instructions from a veterinarian. Try gentle pet massage and ice therapy if your dog will allow it. Tripawd dogs and cats are pre-disposed to chronic arthritis and joint pain more than four-legged pals. 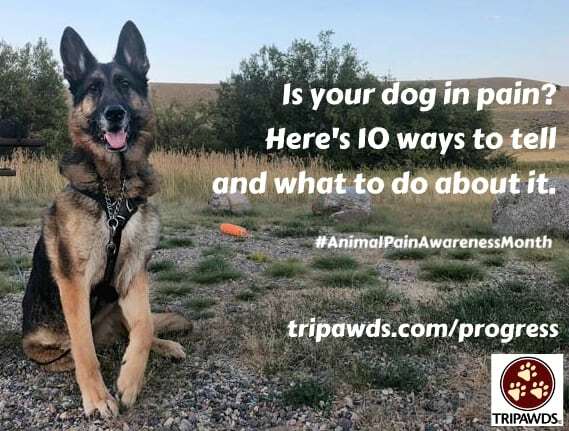 As Tripawd pet parents, it’s our responsibility to stay on top of all the ways they are trying to tell us they hurt, in order to give them a quality, pain-free life. 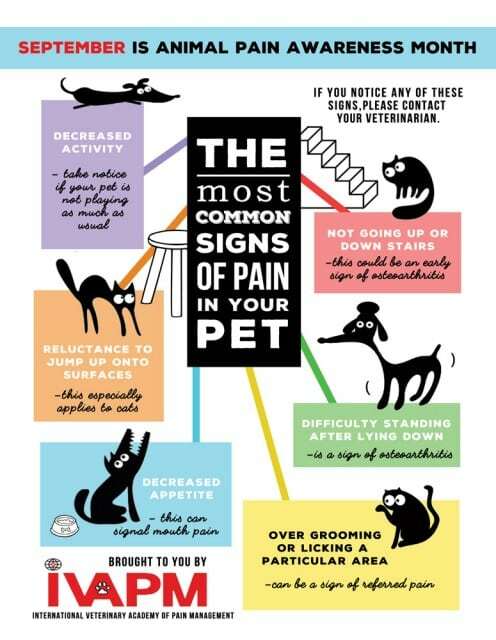 Is Your Dog or Cat in Pain? Here’s How to Know the Signs. 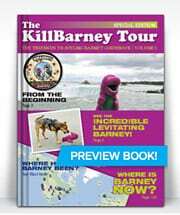 Read all Tripawds pain management posts.